With our newest logo, the familiar “Big G” continues to exemplify strength, longevity and trust – and now love. Logo evolution over the years. [SNIDE OBSERVATION ALERT] Screenshot of the website. Don’t you hate when Photoshop does this thing where if a curve hits the edge of the file and you resize it, it messes the apex of the curve? I hate it too but when I see it, you know, I correct it, especially if a million people are going to see it too. Designed in 1954 by Lippincott & Margulies, the cursive “G” is one of the strongest — perhaps most underrated — corporate monograms. It’s so strong it can withstand bland typography and useless dots as in the last version of the logo… although, yeah, that was terrible. The new logo does away with the dots but introduces a heart to punctuate the monogram. When I first started reading about this I assumed it would be a brief campaign-y thing, like when a corporation turns 50 or 100 years old and has a short-term anniversary logo but, nope, this is for the long haul. I have to admit, graphically, it’s not bad. The heart does have a nice little nook to nestle in, and its weight is well balanced with the “G”. But a heart, coming from one of the biggest companies in the world, feels so inauthentic. Even if they mean it — and I’m sure they do — it’s like, no, just be a money-making company and leave all of our collective feelings at the door. The wordmark is typeset in Gotham, which just adds to the corporate, mandate-to-connect-with-people, heavy-handedness of the redesign. Nothing against Gotham but when Gotham is paired with a major corporation it’s so blargh. But, hey, look, a heart! (Est. 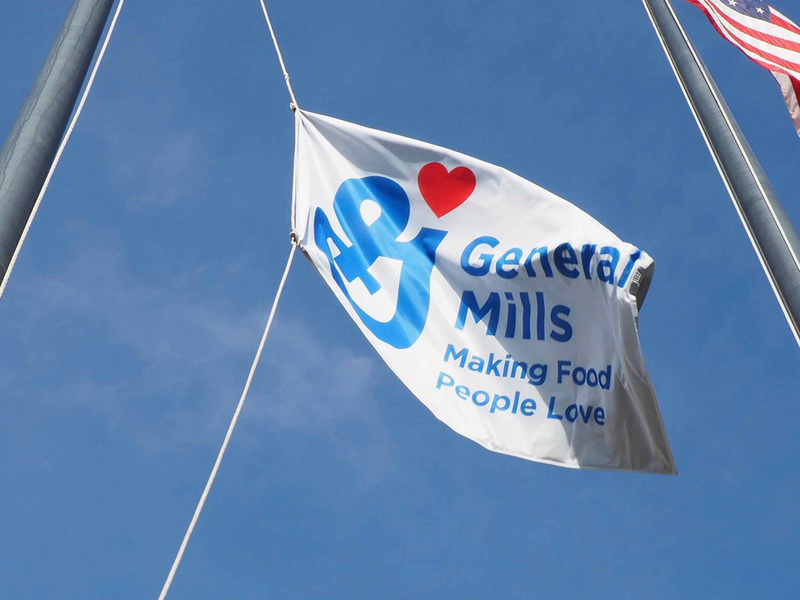 1928) \"General Mills is a leading global food company that serves the world by making food people love. Its brands include Cheerios, Annie's, Yoplait, Nature Valley, Fiber One, Häagen-Dazs, Betty Crocker, Pillsbury, Old El Paso, Wanchai Ferry, Yoki and more. Headquartered in Minneapolis, Minnesota, USA, General Mills generated fiscal 2017 consolidated net sales of US \$15.6 billion, as well as another US \$1.0 billion from its proportionate share of joint-venture net sales.\"